The turkish angora is the oldest of the longhaired breeds, first documented in the 16th century, but it has even longer history. It is possible that it was brought to Turkey in the twelfth century and that it was originally domesticated by Tartars. Turkish Angora came to Europe during Renaissance. When it came to England it was interbred to Persian and by the World War I almost ceased to exist. In the 1930s the Turkish government set up a rescue operation and together with Ankara Zoo started breeding white Turkish Angora. They are still continuing with the program today. 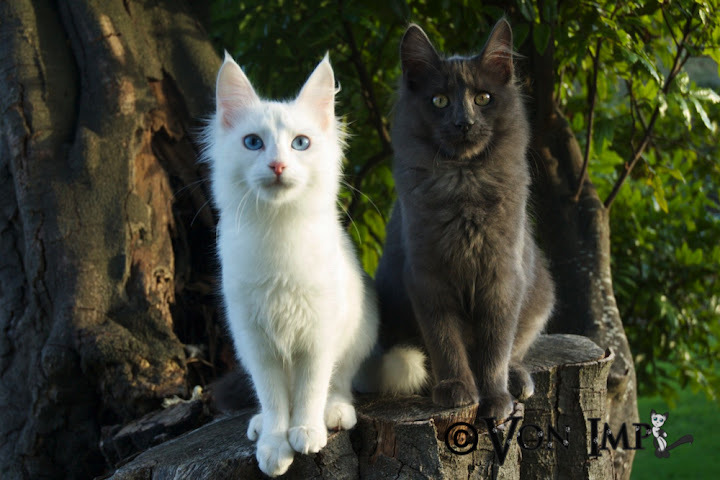 White odd-eyed cats are specially prized, but today Turkish Angora come in many colours and patterns (except pointed, cinnamon and chocolate, which indicates outcrosses - although there are some breeders working with these colours and hoping they will be recognized). The turkish angora has silky coat and an elongated body which combines the elegance of the oriental breed and solidity and firmness of a more moderate cat. It has extra large ears, erect and set high and close together. Eyes are large, soulful. It has amazingly beautiful furry tail.